Many women around the world admire how French women dress and would like to dress in a similar style. Like yourself, many would like to know which items are French wardrobe basics and form the basis of a French wardrobe. In this article I will be listing them to give you an idea of items you may like to acquire. However, I will start by sharing with you the principles that many French women follow when creating their wardrobes and cultivating their overall look. If you follow these principles, you will eventually learn how to acquire the French wardrobe essentials and learn how to dress like a French woman. I will also show you which colours French women prefer and the reasons why, the type of fabrics and patterns they prefer, tips on how to accessorise your look, build a collection of shoes that will take you anywhere and ideas on how to wear your hair and make-up the French way. Simplicity - French women prefer clothes that are very simple in style, almost minimalist. They create outfits that are very simple, but add accessories to jazz them up. Timeless Classics - The styles that they prefer are timeless classics that stand the test of time. However, these classic garments are in no way frumpy. French women have a keen eye for contemporary classics or classics with an edgy twist to keep their look uptodate. Modest and feminine - More modest and feminine styles are chosen rather mini skirts and cleavage revealing tops or aggressive styles. Elegance, Quality and Fit - Elegant clothes are chosen in good quality natural fabrics. Attention is paid to ensuring the clothes fit well. Less is more / Mix and Match - French wardrobes are small and based on a small collection of simple and highly versatile garments that easily mix and match. An ongoing process of reviewing and editing - In order to stay well dressed throughout their lives, French women regularly review their wardrobes and discard worn out or unsuitable items. An interest in fashion and style - French women like to keep uptodate with fashion and may incorprate a few of the current trends into her wardrobe to update her look. French women prefer to own clothes in neutral colours. Examples of neutral colours include black, white, grey, cream, camel, navy and denim. They easily mix and match with each other. They act as a blank canvas against which you can personalise your look with accessories such as scarves. They are non-memorable. They don't stand out as much as a colour such as red, and can be worn more often without people noticing. French women often wear the same outfit two days in a row, but change the accessories to make it look different. A French womans wardrobe is based around a few simple basic items. French women have created a minimalist closet by paring their wardrobes down to essentials that meet their lifestyles. French wardrobe basics include items such as a pair of jeans, a black skirt, black jacket, LDB, white T-shirt, white shirt. As you can see from the above, many French women choose to base their wardrobe on clothes in basic neutral colours. They may add in a few items in a printed fabric or fabric with a texture, but they are very careful about what they choose as it needs to be versatile and match the basics. 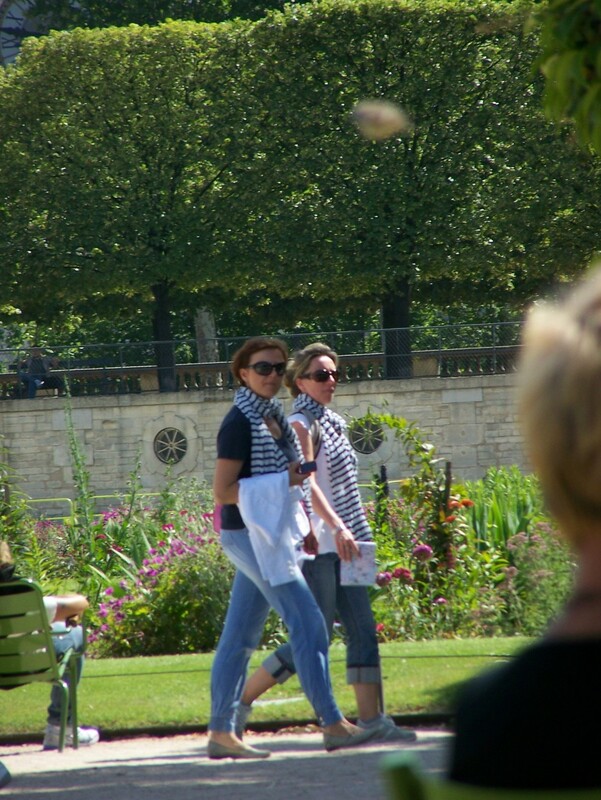 French women very rarely wear floral prints and have a great love for Breton stripes (see the photo on the right). If they wear texture, it will be in a simple neutral colour such as a black lace, a tweed based on neutral colours such as black, white and grey, a neutral suede or leather leather or a simple textured knit. These textured fabrics won't be complicated as French women like to keep their clothes simple. When buying your clothes make sure that they fit. If they are not a perfect fit have them altered. The idea is to almost make your clothes seem invisible so that we see you rather than the clothes. How many times have you noticed a womans clothes before you notice her because they are too tight or too baggy and totally unflattering? Find a good tailor who can take up hems on skirts and trousers to lengths that are most flattering on you and can also take in jackets and dresses to give you a more tailored and slimmer shape. 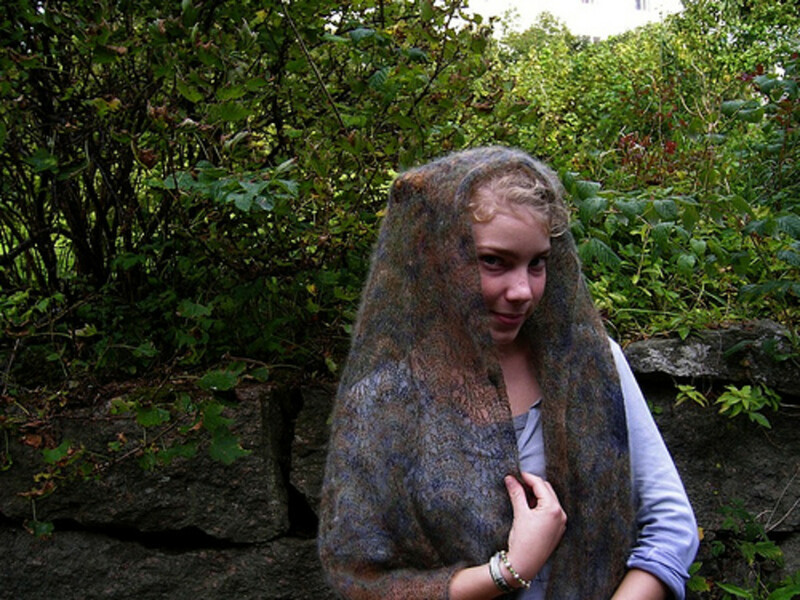 For French women scarves are their KEY accessory and worn all year round. They are French wardrobe essentials. In the winter a French woman will wear a snuggly and warm heavy weight scarf with her winter coat and in the summer a thinner weight scarf, worn with a t-shirt, cotton blouse or light sweater. Scarves are inexpensive and a scarf in a beautiful colour, interesting pattern or texture can spice up an otherwise plain and simple outfit. 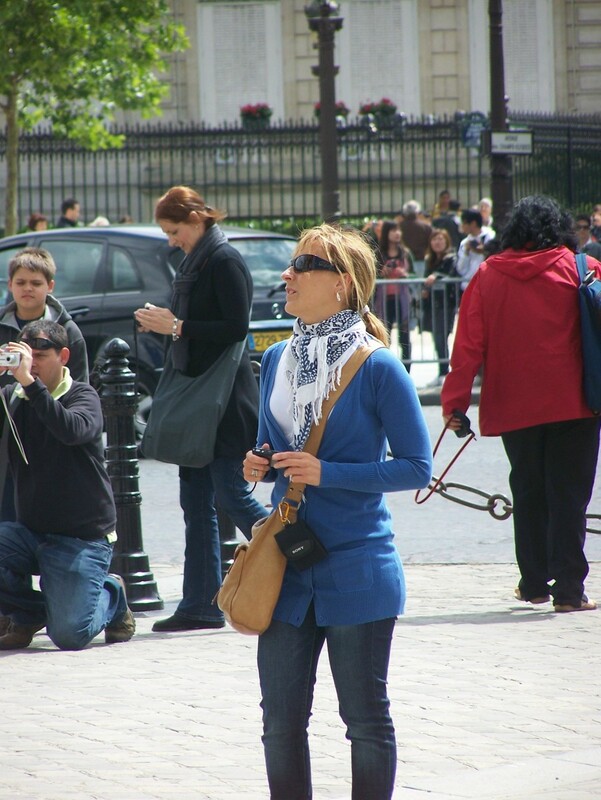 French women wear their scarves in a myriad of ways - around their necks, as a belt, on a handbag, and around their head. French women are also quite creative in the way that they tie their scarves. Many women try to copy their scarf tying techniques but without much success. So what is the secret to how they tie their scarves? I have written a couple of articles which will show you several creative ways that you can wear your scarves. Just click on the links below to learn how to tie scarves like French women. The minimalist shoe wardrobe - 12 pairs of shoes is all you need. Do you own too many shoes? Never have the right shoes when you need them? Did you know French women own just a few shoes? Their secret? By owning just these 12 pairs of shoes, you will always have the right shoes to wear whatever the occasion. A French woman doesn't own many shoes. What she does own however, is a small collection of shoes that she has carefull thought about and edited, that perfectly meets her needs. For maximum versatility, her shoes are usually in neutral colours such as black or brown, so that they can mix and match with her clothes. For winter, she chooses a pair of smart winter boots that go with her winter coat. Of course, women need shoes for other occasions such as weddings, parties and holidays. I have written an article on how you can create a small and minimalist footwear wardrobe like a French woman, that takes into account your lifestyle. I hope that you will find it useful. To read it, click here. As well as scarves, French woman also own a small collection of other good quality accessories with which they can change the look of their outfits, pulling it together and giving it an individual look. Accessories are worn only a few at a time - again keeping it simple. Coco Chanel is famous for advising women to look in the mirror before they go out and take off one accessory. French women favour an easy to achieve natural look for their hair and make-up and this a is key component of their overall "look". You will rarely see a French woman wearing garish make-up or hair dyed in unnatural looking colours. Hairstyles - Natural colours and easy care chic hairstyles are prefered, such as a shoulder length bob, which is kept in good condition and worn in a variety of styles, such as worn down or in a ponytail for day or worn up or in a chignon for evenings. Skin Care - to keep their faces looking youthful, French women spend a lot on their skin care . 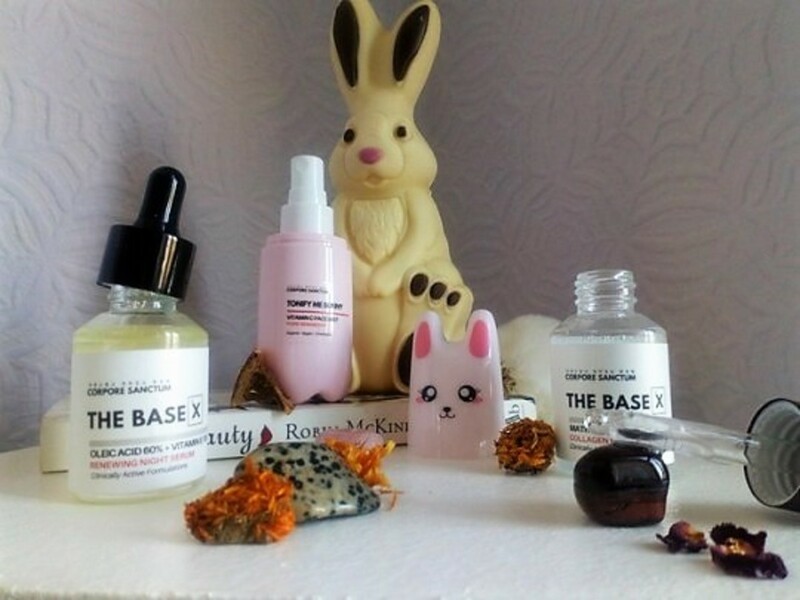 They avoid the sun and wear foundation with sunscreens, have regular facials and regularly cleanse, tone and moisturise. Make-up - they prefer a natural "no make-up" look, applying a light touch of foundation, and lipstick and eye make-up in neutral colours. The idea is to enhance what you have rather than change it. They will often wear a bright red lipstick, or enhance their eyes with smokey grey eye shadows and eye liners. Last but not least, French women like to treat themselves to beautiful underwear and will wear it all the time. The don't believe in saving it for special occasions and enjoy how feminine it makes them feel. The French 10 Item wardrobe - This post is based on the best selling book by Jennifer L Scott - "Secrets of Madame Chic - 20 stylish secrets I learnt while living in Paris". 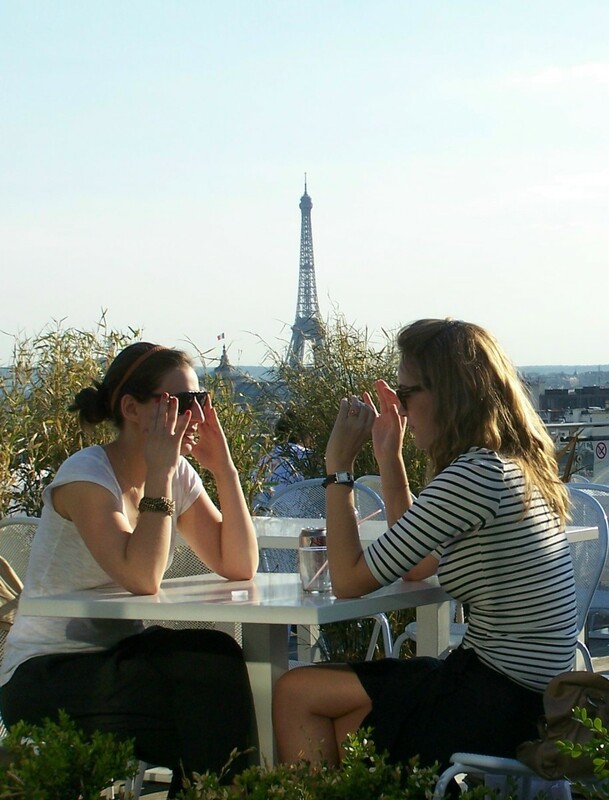 Jennifer spent a year as a student in Paris, living with a wealthy host family. To Jennifer's surprise, the mother of the family, who she called Madame Chic, only had 10 items of clothing in her wardrobe at any one time, but always looked well dressed whatever the occasion. Read the full article to learn more about Madame Chic's 10 item wardrobe and how you can create your own chic 10 item everyday wardrobe. Scarf tying techniques - French women are famous for wearing scarves in a stylish way, Learn how they do it. These articles contain easy to follow Youtube video clips. How to be chic blog - be chic in all areas of your life, health, home, relationships etc.